The Great Wall was impressive at Mutianyu, with beautiful green mountains all around. I wasn’t quite expecting it to be so tough to walk around, in the midday heat with more steps than I have ever seen, or for there to be a luge slide back down to the car park (which was fun!). 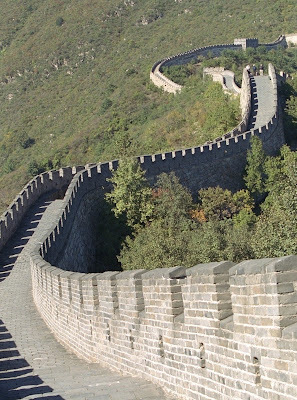 Getting to the wall is just 90mins from Beijing in a taxi. I am spending 3 days travelling around Bejing and 2 days in Shanghai with a friend from business school. Overall, I found Beijing and Shanghai to be fascinating cities, each for different reasons. Shanghai doesn’t have much in the way of sights, the main one being around the Bund waterfront area (see below), but has a vibrant, modern social scene. Yu Gardens, People’s Square and Nan Jing road are also worth checking out. 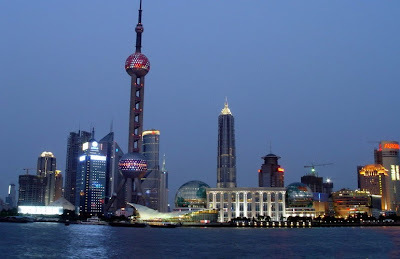 I was amazed by how many expats there are living in Shanghai and how developed the expat scene is. You can experience restaurants, cafes and bars that are even more modern than New York and you would not know you were in China. In fact, the contrast between the rich expats and some of the poor locals is very extreme and saddening. Whilst it was interesting to experience the expat scene, I did not feel comfortable with this artificial bubble and New York prices. Beijing has much more cultural sights (don’t miss the Forbidden City, Summer Palace and Tiannamon Square) as well a cool evening hang out area around the lake. I also enjoyed taking a rickshaw around the Hutong area near the lake. Being in the city 60 days before the Olympics was nice as there was an air of excitement and pride, as the nation is keen to demonstrate to the world how advanced it is. Having said that, they still seem behind with the construction of parts of the Olympic village! I also took the opportunity to have a traditional Chinese massage at Dragonfly, a beautifully decorated place. However, it was not quite as amusing as my friend’s massage in his room at the Grand Hyatt. He saw a sign advertising a massage service in his room and called the concierge to book an appointment. A 50 year old lady came up to his room and gave him a traditional Chinese massage. At the end she said to him “you want oily?” and made a wanking gesture with her hand. For the record, he declined. My one disappointment with China was the food. It doesn’t help that many menus are not in English, or badly translated. Plus the Chinese love eating weird things – like jellyfish and dog. It is hard to find just a regular meal where you would actually want to eat the meat. I originally thought that they preferred to eat the odd parts of the animal (e.g chicken feet, head, bones) because it is a poor country, but that’s not the reason. Chinese people actually prefer these parts and in fact pay more for them, which I find bizarre!